Five new expansion packs for LEGO Dimensions, the LEGO toy and video game hybrid, will be available beginning September 12, 2017. One of the reasons playing LEGO Dimensions is so fun is because you can mix and match some of your favorite characters from a variety of television, movie, and video game properties within the video game. Soon characters and settings from Teen Titans Go! and The Powerpuff Girls, two popular Cartoon Network animated series, and the '80s era fantasy comedy Beetlejuice will be added into the mix. The Teen Titans Go! Team Pack includes LEGO minifigures of the DC Super Hero team Raven and Beast Boy. It also features the 3-in-1 T-Car which can also be rebuilt into a forklift and plane. Players can also transform the Spellbook of Azarath into Raven Wings and the Giant Hand to either take flight or dig through the earth for adventures in the sky as well as under the ground. The Teen Titans Go! 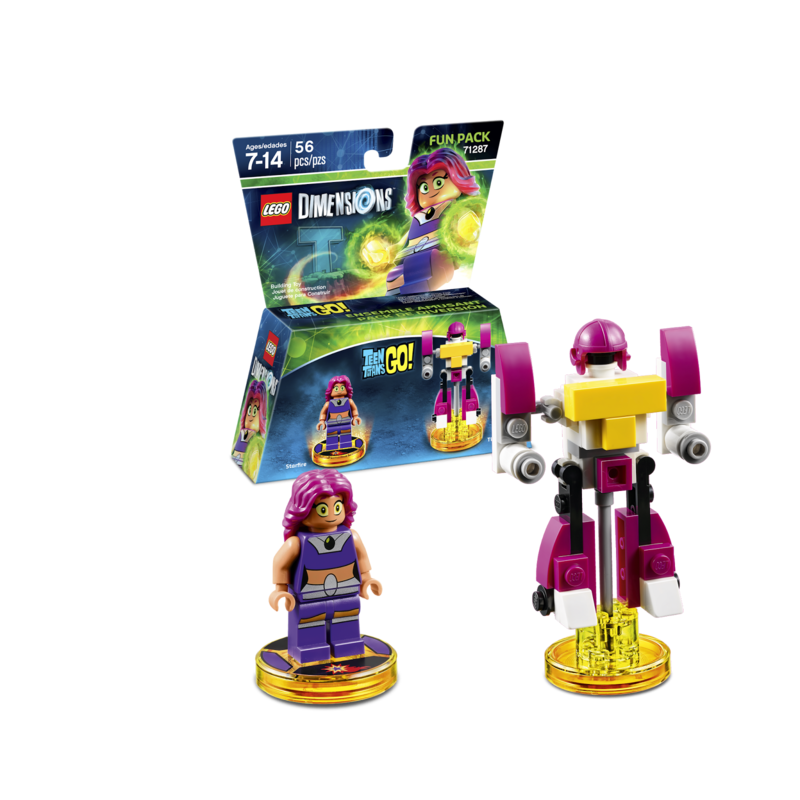 Fun Pack includes a Starfire LEGO minifigure. Players can unleash her special abilities to battle enemies and solve puzzles. 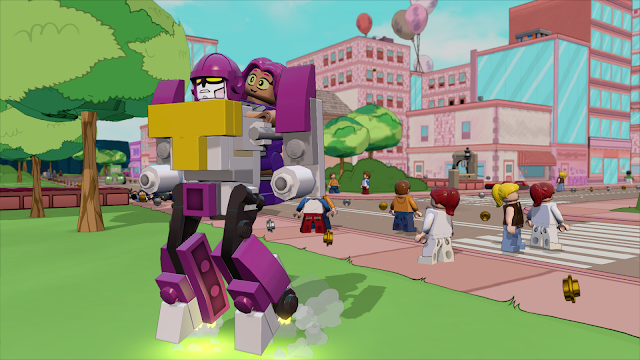 Players can also build the 3-in-1 Titan Robot for a roller-coaster fun-filled adventure and then rebuild it into a rocket or robot retriever for more supercharged adventures with the rest of the Titans gang. Raven, Beast Boy and Starfire each provide access to the Teen Titans Go! Adventure World in Jump City where players can explore several psychedelic areas from the Titans Tower to Wacka Doodles Amusement Park. 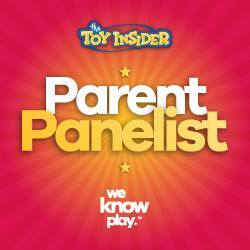 Purchasing either of the Teen Titans Go! 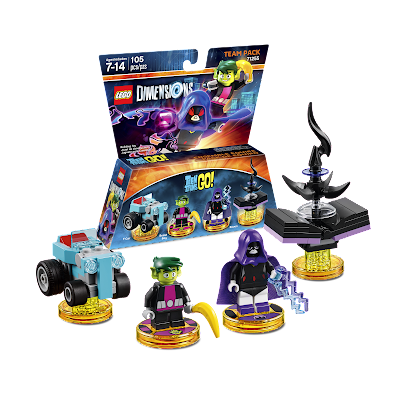 expansion packs allows access to an exclusive original animated episode of the TV show where viewers discover how the vibrant team of teenage heroes stumbled upon the LEGO Dimensions multiverse. 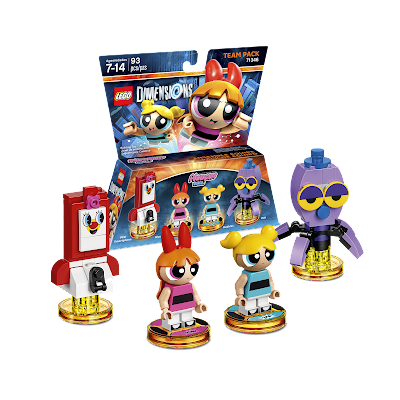 The Powerpuffs Girls are also joining in the LEGO Dimensions fun with an upcoming Team Pack and Fun Pack coming to store shelves. The Team Pack includes LEGO minifigures of the super-powered sisters, Blossom and Bubbles. Players can access special abilities through the 3-in-1 Octi which can be rebuilt into a Super Skunk or Sonic Squid. There is also the PPG Smartphone included in this expansion pack that can be rebuilt into a hotline or mag-net. 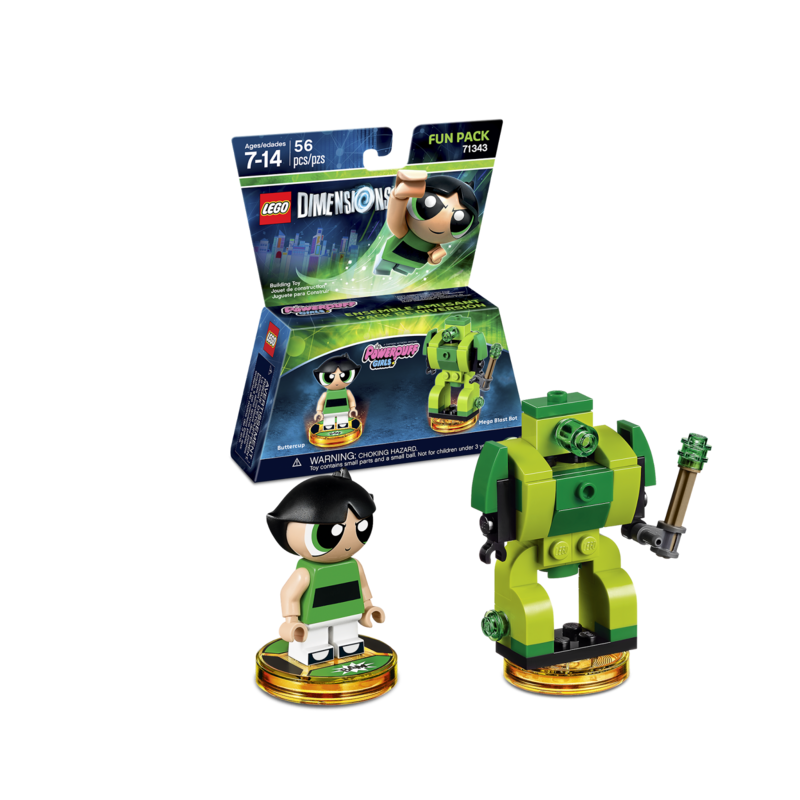 The Fun Pack includes a Buttercup LEGO minifigure. Players can use this character to fight crime with cool superpowers. She comes along with the 3-in-1 Mega Blast Bot which can be rebuilt into the Ka-Pow Cannon and Slammin' Guitar to rock extra-awesome combat abilities. Blossom, Bubbles and Buttercup each provide access to The Powerpuff Girls Adventure World where players can unlock iconic locations like Pokey Oaks elementary, Rainbow Land, and Professor Utonium's lab. 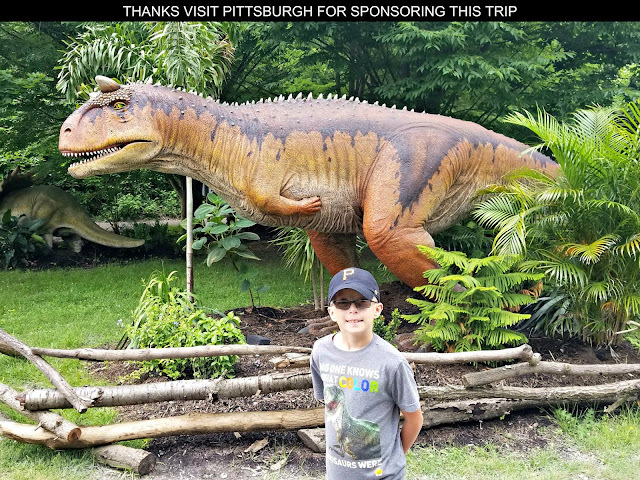 They also unlock a themed Battle Arena where up to 4 players can engage in head-to-head competition against one another in capture the flag style contests. The Beetlejuice Fun Pack brings some spookiness to LEGO Dimensions with a Beetlejuice LEGO minifigure with supernatural powers. The character also unlocks its own exclusive Adventure World and Battle Arena. 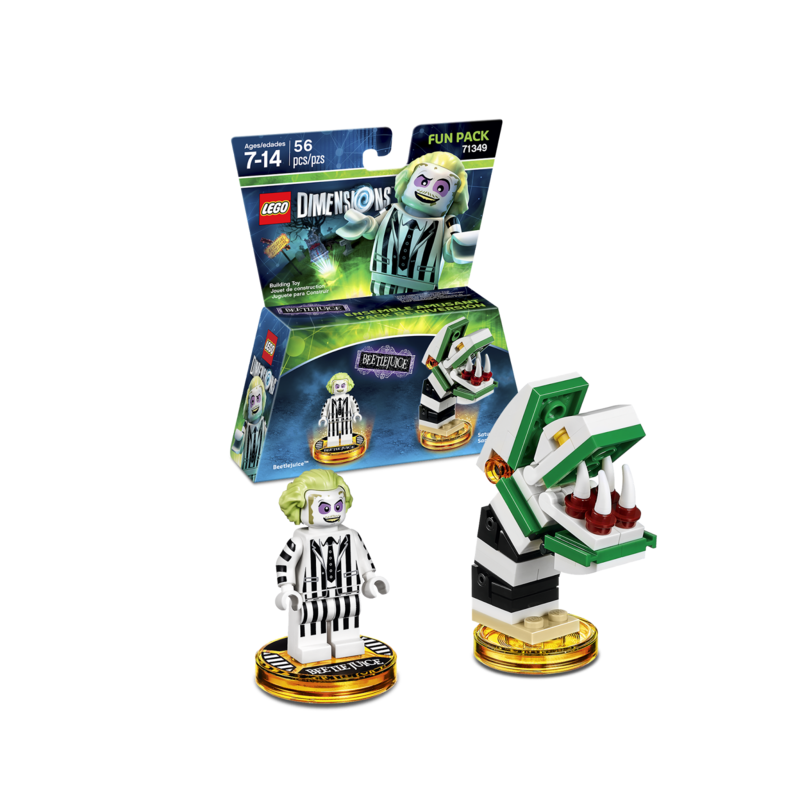 The minifigure is accompanied by a buildable Saturn's Sandworm which can also be transformed into a haunted vacuum and spooky spider.